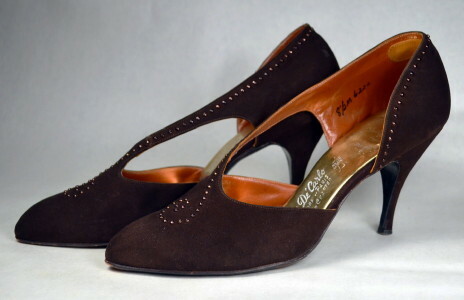 Late fifties, early sixties cocktail pumps. Dark brown suede. Trimmed with faceted dark copper studs in swirl pattern from quarter to vamp. Cross over strap extending from quarter to vamp. Rounded point closed toe. Open shank. Closed quarter. Metallic leather liners. 3 1/2 inch spike heel. Length, measured inside foot bed from toe to heel - 10 1/4"
EXCELLENT condition. Shows slight wear at soles.